Italian apple marketer VI.P Val Venosta appears to have engineered an almost seamless transition between its outgoing and incoming managing directors, thus ensuring continuity for its grower members and customers alike. 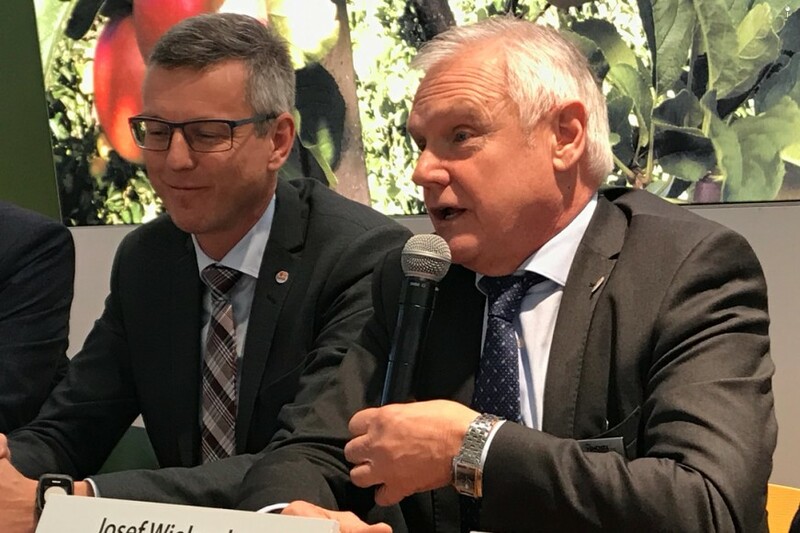 New director Martin Pinzger spoke officially to the press for the first time at Fruit Logistica in Berlin. He was sitting alongside current director Josef Wielander, who confirmed his decision to step down after a remarkable 43 years with the company – including two decades in his current role. Wielander’s successor has a similar track record in terms of his pedigree in the fruit business: like his predecessor, Pinzger has spent around 20 years in charge of Mivor, one of VI.P’s major member cooperatives. Wielander was chief executive of the same cooperative for a similar period prior to heading up the association. As well as the widely grown Golden Delicious, which is very much a flagship product for the whole South Tyrol apple region, Pinzger said licensed varieties such as Cosmic Crisp, Envy, Kanzi, Yello, Kissabel, Sweetango and Ambrosia were expected to play increasingly crucial role in the Val Venosta brand portfolio. In addition, he noted, the group was committed to developing sales of other seasonal items such as cauliflower, cherries and berries.